Recap 89: Whatsa Matter? Haven't You Ever Seen a Beholder Pirate Before? Recap 89 Supplemental: Whatsa Matter? Haven't You Ever Seen a Beholder Pirate Before? Recap 87: Hear Me, My People! Keep Your Chains on a Little Longer So We Don't Get Attacked! Recap 87 Supplemental: Hear Me, My People! Keep Your Chains on a Little Longer So We Don't Get Attacked! The Motley Too have arrived in Banha at the tomb of Gilez-Hotep. It was once a place visited often by people wishing to hear the predictions of the oracle, but lately, people have been scared to come. There, they meet Lady Katherine, the historian who is also researching the history of this area. She tells them the mercenaries she hired entered the tomb some time ago and she's worried something dreadful has befallen them. They assure Lady Katherine that they will try to find her missing mercenaries. She provides them with a a sheet of translated hieroglyphs as they will surely come across writing within the tomb. Not far into the tomb, they encounter the mercenaries, the Desert Daggers, fighting two wooden giant head statues. Despite their clumsy appearance, the head statues are able to glide easily across the floor as if on wheels. They speak in a loud, stilted tone that's both whiny and commanding. Sir Gyles: Don't let these things get to your head! Battle Leader! Delphine is able to crack open one of the statues with fire and discovers they are controlled by brain creatures as one comes screeching out. The brains use mental attacks on the party, chipping away at their sanity. One of the Desert Daggers has succumbed and attacks The Harper. The Harper calmly stabs the man. His friends are horrified. Once the immediate danger passes, the Motley Too introduce themselves to the Desert Daggers. Although, initially impressed with their fighting skills, the Desert Daggers quickly lose admiration as the members of the Motley Too start talking. Asking them to take some hieroglyphic writings to Lady Katherine for translation, Adarra attempts to hustle the Daggers out before they start actively disliking her comrades. Continued exploration of the tomb reveals traps, mummies, mummy wizards, and many more brain creatures. Although they are able to successfully avoid or reset a few of the traps, Jandove is severely injured and Sir Gyles' superior flaming broadsword is destroyed. 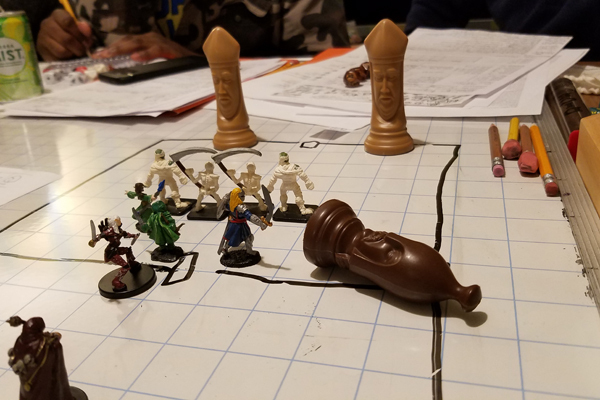 When The Harper turns some of the mummies, the mummy wizard takes it personally. Greater Mummy: Priest of Pain, these mummies are under the control of another. Do you challenge me? The Harper: *shrugs* Yes. Set will not protect you from the Goddess. Greater Mummy: *sneers* Your goddess is weak. Delphine discovers that Greater Mummies are quite susceptible to lightning attacks. The brain creatures are harder to kill. And, unfortunately, for every minute it takes to kill one of the brain creatures, they are able to inflict psychic damage on the party. By the time they've cleared a few of the chambers, many in the group are barely holding onto their sanity. Wileu and Delphine start eyeing their companions warily as paranoia sets in. Wileu strikes Kurtis down while Delphine attacks The Harper. Wileu is dosed with a vial of sweetwater, restoring her mind somewhat, before she cuts anyone else down. The Harper is able to cast True Seeing on Delphine, allowing her mind to clear. In fact, she now very clearly understands that pain is a necessary part of life and it is good to deliver it to others. During their exploration, the party finds a half-buried statue of Bast, the cat-headed goddess. Seeing the statue of Bast, Kurtis excitedly presents his dungeon cat. The ground begins to shake and the statue rises out of the ground. In its hand is a scroll containing a musical score. Playing the melody on a set of tubular bells found in an entirely different chamber opens a secret door. Inside, the walls are covered in hieroglyphs, the ceiling is lit like a starry night. Recording the symbols on parchment, Kurtis volunteers to bring it to Lady Katherine for translation. He will also guard her on her trip back to al-Laquant. When they come across a statue of a humanoid hippo, some of its pieces missing, Sir Gyles hears a voice in his head telling him this is Osiris' nursemaid and to find the pieces. Once they do and they are correctly placed on the statue, it comes to life and looks at Sir Gyles. Sir Gyles: Oh great nursemaid of Osiris, how will you serve us? The hippo immediately walks further into the tomb to an as yet unexplored chamber. The group follows, hearing sounds of battle and the outraged shouts of the brain creatures. By the time they catch up, Osiris' nursemaid has destroyed all of them with apparent ease. Bowing to Sir Gyles, it reverts back to its inanimate state. 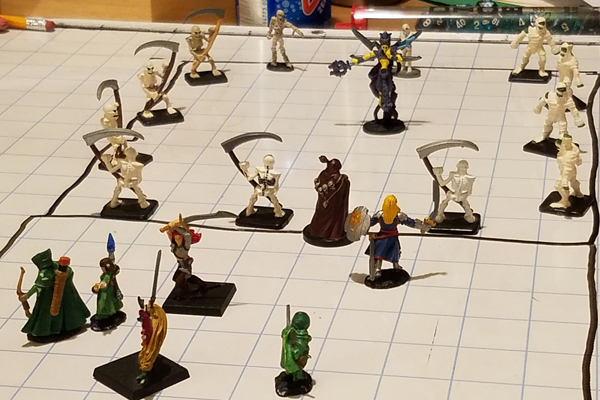 Entering the last chamber, the party has to fight another mummy wizard and its minions. In an attempt to disable one of the traps, Delphine follows a hieroglyphic hint on the wall and "hails Set". Once she does, the Greater Mummy blesses her. She turns to attack Adarra, but has enough willpower to stop herself from blasting the druid with fire. Adarra suggests she might want to renounce Set. Delphine: Eh. *shrug* I renounce Set. And as suddenly as the feeling first arose, any desire to attack her teammates disappears. The rest of the party finishes off the mummies. Sir Gyles approaches the sarcophagus. The face carved into the lid is his own. He again hears a voice whisper to him. If he feels he is worthy, he should take the sword from the sarcophagus and rid the tomb of Set's evil. 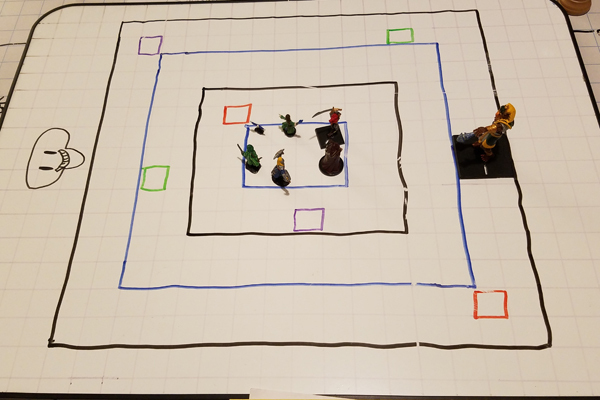 Once Sir Gyles takes the sword, the floor drops, dropping the entire party into a new area. The giant skull hanging on the far wall speaks. Oracle: I welcome thee to the oracle, but I see you have some business to complete first. Set appears as a 9ft tall jackal-headed man. With him are six humans wearing black platemail. Something about them feels warped. Set's minions attack the party, transforming into various animals as they do so. Although it is not easy, the party is able to combine their efforts and kill Set. His minions disappear. Oracle: Quickly now! Your enemies are almost upon you. You are known to me. You are the successors to the Motley Crew. Are you aware of the changes you have made to the timeline? I will tell you this: I am the Oblivion King. In this timeline, I was taken as a boy by the priests of Osiris who had been tricked by Set. They keep the boy asleep and preserved in Nizwah, the City of the Dead, siphoning his power, my power, in order to maintain The Green. If you bring the boy to me, I will give you information on the Staff of Law. This staff has the power to manipulate the substance your golem is made of. You may use it to restore the original Motley Crew. I will hold back your enemies for as long as I can, but you must hurry. Just then, Sir Carian and his Revenge Squad burst into the room. With them are two golems that look like they're made of the same material as Vain. Although these juggernauts seem to move slower, they appear to be just as powerful as Vain. The Oblivion King opens his mouth and the Motley Too rush through, exiting the tomb.